Summary: The Dakota Alert BBA-2500 Break Beam Alert Kit features 2 accurate beam sensors, but in some cases, they are difficult to pair. I recommend Guardline GL2000 as an alternative. Is This Alarm System Right For You? 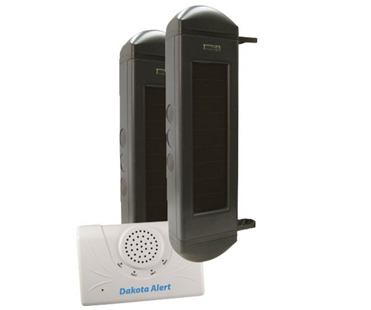 The Dakota Alert BBA-2500 Break Beam Alert Kit uses a solar powered wireless infrared break beam sensor in order to detect people and vehicles. The alarm package comes with 1 receiver (DCR-2500), 2 motion sensors (BBT-2500) and 1 adapter. The alarm features 2 infrared break beam sensors. Whenever people or vehicles pass between the 2 sensors, the receiver will get a signal. You will then get notified by the receiver with a chime. The 2 beam sensors can be mounted at a maximum distance of 300 feet apart. The Dakota Alert BBA-2500 Break Beam Alert Kit features 2 beam sensors that can accurately detect people and vehicles. The 2 sensors are not affected by sunlight, leaves or wind so you will get few to no false alarm. The only drawback of purchasing this alarm is that in some cases the sensors won’t pair (or won’t stay paired after a while). As an alternative, consider the Guardline GL2000.